Probably my new favourite book of modern exploration. An awesome and inspiring adventure. I was gripped for the entire read and the pages ticked by effortlessly. It was always funny, through the ups and the downs. These boys overcame so much through their ingenious problem-solving and dogged perseverance. It makes me even prouder to be an Aussie. I enjoyed it. It labours the day to day a little through the final 100 pages. It in all, if you're looking for a good read and a little insight into how to plan an expedition somewhere cold and wet and the things that can go wrong, you'll get good value out of this. Interesting commentary too on how adventure and doing hard things generally changes you. Another book that I would recommend that everyone aught to read. 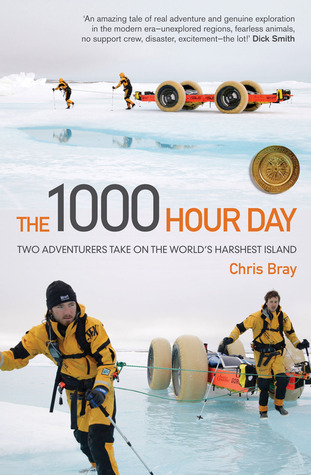 Chris Bray and Clark Carter, in their early 20's, tackled an amazingly tough unsupported trudge across Victoria Island in Arctic Canada. While it took them two bites, they managed 1000 kilometres east to west in some of the toughest conditions imaginable. The surprise of the book, was the wisdom and the attitude of these two. That's why I would urge 'young people' specially to read it. Some oldies like me have experienced a very small taste of their journey and can only say, "yep". From being chased by wolves and stalked by polar bears, to enduring truly horrific weather conditions and even worse terrain, this book has your attention from the get go. While the parts covering the journey across the island is enthralling, I really enjoyed reading about the preparation for the journey. For two very young guys (I think Chris was 20 and Clark was 19 when they first started planning – I might be wrong), they were very switched on to the task they had set for themselves. I found myself bewildered at times at how thorough their planning was and how many big name sponsors they managed to get on board, despite many big companies believing that there was no way that they would be able to finish this mammoth adventure. This is the perfect example of proving people wrong.It’s also a great example of the things that young people can do when they have the drive and the support that they need. We don’t all have to go out and trek across frozen tundra, but if you want to do something, have the belief you can do it and not care too much about what other people think, then there is no reason that you can’t achieve the goals you set for yourself. I must admit, this book certainly whet my appetite for adventure and made me wish I was the “outdoorsy” type. Good read, Well written story that holds your interest even though you think initially there's not much to talk about in an Arctic adventure. I've got the greatest admiration for both of them for their perserverence and determination to follow through on what started out as a seemingly impossible journey. Detailed insight into a one-off experience. Lots of messages for the reader- inspiration, motivation and product recommendations. Really impressed by the story from the beginning to the end, and also the ongoing journey. Loved every hour. Wow! One fast and very inspirational read.